Mix two favorite cake ingredients with Chocolate Cluster-Peanut Butter Cake. 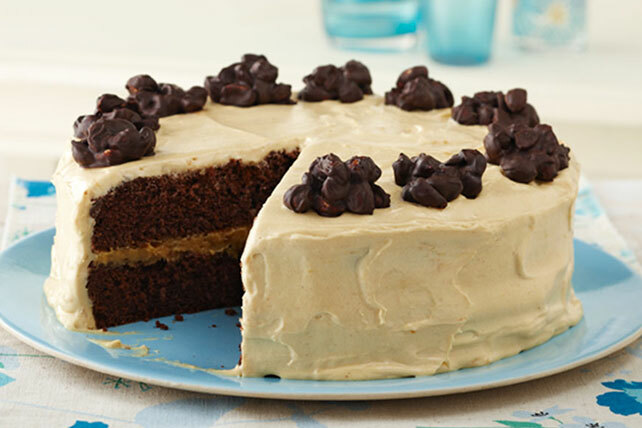 Peanut butter cake and chocolate cake lovers will applaud this creamy combo! Prepare cake batter and bake as directed on package for 2 (9-inch) round layers. Cool cakes in pans 10 min. Remove to wire racks; cool completely. Meanwhile, beat pudding mix and milk with whisk 2 min. Add peanut butter; mix well. Refrigerate until ready to use. Mix nuts and melted chocolate until nuts are evenly coated. Drop by tablespoonfuls onto waxed paper-covered baking sheet. Refrigerate 10 min. or until firm. Stack cake layers on plate, filling layers with 1 cup pudding mixture. Gently stir COOL WHIP into remaining pudding mixture; spread over top and side of cake. Decorate with chocolate-nut clusters. A serving of this special occasion cake goes a long way on chocolate flavor. Microwave chocolate in microwaveable bowl on HIGH 1 min. 10 sec., stirring after 30 sec. (The chocolate will retain its shape.) Stir until chocolate is completely melted.